In Friuli the area of San Daniele is a few miles distant from the foot of the Alps, a delightful hill where, at the beginning of the 1300s, Girolamo Sini told us in “Cronache della Magnifica Comunità di San Daniele del Friuli” about the small town today famous all over the world for its excellent ham. A few chilometres away from Udine, San Daniele is produced and stored in airy “rooms” which the farmers reserved for their tasty “prosciutto”: the months of curing comes really from the tradition! 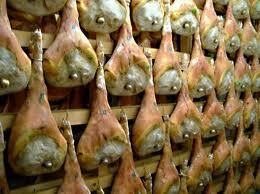 The medieval carvers stated that the number of months has to be equivalent to the weight in kilos of the fresh leg. For tasting? If you are visiting the splendid gothic features of Udine, just go down the producers’ shops and ask for the “prosciutterie” to have a magnificent slice of San Daniele ham and a lovely taste of wine! At the end of August you can’t miss in San Daniele the celebration called “Aria di Festa“. It is a party completely entitled and dedicated to the precious and famous ham!! The gastronomic wandering in Friuli is not complete if you do not go and try in the ancient “ostarie” the most traditional dishes of Friuli unusual cousine. Let’s have a go with a particular and tasty “gnocs cu’ lis siespis” (potato gnocchi with plums), getting on with some “us e spacs” (hard-boiled eggs and asparagus), then we can choose “musét e bruade” (pig’s head with turnips) or a “sopa de fasuj e uardi” (bean and barley soup), some “cjalçons” (agnolotti) dressed with “scuete fumade” (smoked and grated ricotta and melted butter). Don’t worry the menu are translated! Or you can always close your eyes, point a finger and…something delicious will appear in front of you anyway! You should have a bite of the Montasio cheese, another excellent delikatessen of the region ! Do not forget a lovely trip inside the wines of the area, fantastic choice of both delicate and robust flavours: the area of Cividale is for example the core-centre of the Doc zone “Colli Orientali”, where the great white wines come from. We start with a Tocai Friulano and we can get crazy tasting the rare but unbelievable Picolit. The closest osteria (hostelry) in one of the historical alleys of Udine will provide you with everything. In the hostelries the customer the ritual of the glass of wine (il tajut) is really an opportunity for meeting with each other. This entry was posted on Friday, August 17th, 2012 at 10:53 pm	and is filed under Italian Recipes and Food. You can follow any responses to this entry through the RSS 2.0 feed. You can leave a response, or trackback from your own site.